Great Lakes Energy (GLE) in Michigan decided in late 2017 to approve a plan to incrementally deploy Fiber-to-the-Home (FTTH) to cooperative members, beginning with a pilot project in Petoskey. This week, Vice President of Communications, Marketing and Energy Optimization Shari Culver from GLE joins Christopher to talk about what could possibly become the largest FTTH project in the state. GLE anticipates offering its symmetrical Truestream Internet access to members in the pilot area as early as the end of October. The planning process, however, has involved several feasibility studies and at least two years of planning in addition to several more years of contemplation. Shari explains how the region GLE serves covers many different types of geographies, subscriber income levels, and different levels of Internet access competition. Some folks have only dial-up, while others have the option of cable Internet access. One of the challenges GLE faces is educating potential subscribers about the differences between what they have now and the potential with Truestream. She explains that the cooperative has decided to approach deployment with a flexible incremental approach, carefully examining demand as they deploy to determine where they go next across their service area. There’s a significant portion of seasonal homes in this northern section of the lower peninsula, and GLE sees that high-quality Internet access can help boost local economic development if those seasonal visitors have the ability to stay longer by working from the cabin. This week on the podcast, we get insight into a community network that puts extra emphasis on the word “community.” Diana Nucera, Director of the Detroit Community Technology Project (DCTP) talks with Christopher about how the people in her city and their diversity are the driving forces behind the connectivity they have created. Diana and Christopher review the origins of the DCTP and some of the challenges Diana and her group have had to contend with to get the project this far. She also describes how the program is doing more than providing Internet access at a reasonable cost and how perspectives about technology extend into many other areas of life. Those perspectives influence how people use or don’t use the Internet, which in turn, impact digital inclusion. Getting people online is only one ingredient in the recipe for digital equity. In addition to information about the specific ways stewards in the program help expand it, Diana describes how they and other participants in the program have benefitted in unexpected ways. She shares the progress of the DCTP and, most importantly, some of the valuable lessons that she’s learned that can help other communities who may decide to establish similar programs to help improve digital inclusion on a local level. This show is 40 minutes long and can be played on this page or via iTunes or the tool of your choice using this feed. You can listen to the interview on this page or download the mp3 file directly from here. A year ago, we last had Jonathan Chambers of Conexon on the podcast to discuss the pros and cons of the Connect America Fund. 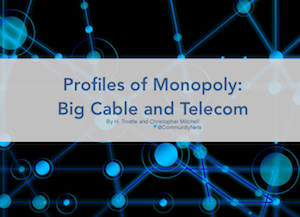 Since then, the FCC has held an auction to expand connectivity in rural areas as part of the Connect America Fund Phase II (Auction 903) and recently released news of the winning bidders. In episode 321 of the podcast, he’s back for another conversation on the process and the results. In addition to a brief history on the Connect America Fund, Jonathan and Christopher spend some time discussing the arguments for and against federal funding dedicated to rural deployment. Do ISPs really want to serve residents and businesses in rural areas? Based on the results of the auction, the answer is yes. As Jonathan notes, this year’s bidding process has been more transparent in years past, but in order for the program to be a true success, there also needs to be accountability. Christopher and Jonathan also discuss the results from this auction and the strong showing that rural electric cooperatives made in the auction. They talk about some of the technological challenges that may arise for some of the bidding firms that promised results that may be beyond their capabilities. Christopher and Jonathan also discuss some of the areas of the country where firms receiving Connect America Funds will deploy. You can view lists of bid winners and the news release about the auction at the FCC website. There are also maps available at the FCC, to offer visual representations of areas to receive infrastructure, along with eligible areas, and related documents. This show is 51 minutes long and can be played on this page or via iTunes or the tool of your choice using this feed. Plenty of local communities are interested in the possibilities of creating publicly owned Internet infrastructure but pause when it comes to funding. This week on the podcast, Christopher interviews Jase Wilson, CEO, and Lindsey Brannon, Head of Public Finance, from Neighborly. The firm is working with local communities and using an innovative approach to financing publicly owned infrastructure projects, including broadband networks. Neighborly provides an online investment platform that allows individuals to invest in projects funded through municipal bonds. In addition to more traditional projects suited to the muni bond market, such as transportation, education, and housing, Neighborly is working with local communities that want to develop open access municipal networks. In this interview, Jase and Lindsey describe how the open access network fits so well with the firm's philosophy. In addition to helping drum up the capital for muni deployment, Neighborly sharpshooters recognize that the opportunity for individuals to invest directly in a municipal project in their community will help the project ultimately succeed. After all, the investment is about more than turning profit when it’s providing fast affordable, reliable connectivity in your own hometown. Lindsey and Jase discuss some of their past work and talk about the new Community Broadband Accelerator program that offers additional tools to communities investing in open access fiber networks. Specifics about the program are available on the Neighborly website and during the interview we get to hear more about the advantages of participating in the Community Broadband Accelerator program. Communities who want the best for their citizens typically recognize the importance of digital equity and often take steps to develop digital inclusion programs. Last year on the podcast, we invited folks from the ISP Monkeybrains to explain how they were working with the city of San Francisco to develop a way to provide high-speed connectivity to residents living in several public housing facilities. We decided it was time to share the details of their model so other communities could consider their approach as a workable plan. Our summer Public Policy Intern Hannah Rank took on the task of writing a detailed report about the project. This week, she sat down with Christopher to offer a preview of what she’s learned. In addition to an outline about the history of ISP Monkebrains and where they obtained additional funding for the project, Christopher and Hannah discuss the pros and cons of the California Advanced Services Fund (CASF). They discuss how a smart digital inclusion program as part of such a plan to offer broadband to lower-income households can help those enrolled and help keep overall costs down. Be sure to look for the release of our report this fall to learn more details about how San Francisco and Monkeybrains are bringing better connectivity to public housing to help residents participate in the digital economy. Until then, you can learn more about Monkeybrains and the plan by listening to episode 264 of the podcast. In the most recent report from the Blandin Foundation, Researcher Bill Coleman from Community Technology Advisors and his crew put boots to the ground to examine the results of Connect America Fund (CAF II) investments. Bill recently visited our office in Minneapolis to discuss the report with Christopher for episode 318 of the podcast. You can download the report, Impact of CAF II-funded Networks: Lessons From Two Rural Minnesota Exchanges here. Bill and Christopher discuss the challenges Bill and his team encountered when they initially decided to gather documentation on what services CAF II funded projects brought to rural Minnesota. In order to get past those challenges, the researchers devised a methodology that other communities can reproduce. Once the team had answered the technical questions about infrastructure, they analyzed the results and applied them to Minnesota’s statewide goals for broadband access. They determined that, in addition to lack of transparency regarding CAF II network plans, the tendency to invest in slower speeds, including DSL, will not help Minnesota achieve its goals. For people living in urban areas who have grown accustomed to broadband within reach, it’s hard to imagine the situation in rural Minnesota, where there are still homes that have no access to the Internet at all. The disparity in speeds and availability complicate the idea that rural folks should have access to high-quality connectivity at the same levels as people living in urban centers. They say the “finger of fate” is fickle, but this week it was our recording equipment that turned on us. Unfortunately, time constraints and prior commitments didn’t allow Christopher the opportunity to make a useable recording of his interview with Bill Coleman from Community Technology Advisors Bill was going to be our guest for episode 318. As a result, we’ve had to shuffle schedules and episode 318 will be available later this week. Thanks for your patience! Bill has promised to join us for a future episode. He and Christopher plan to discuss the report he and his team published for the Blandin Foundation on CAF II and how the federal program is doing little to help rural communities in Minnesota. In the near future, we plan to also interview Hannah Rank, a Public Policy Intern at ILSR, who has worked with us over the summer and is finishing up a report on ISP Monkey Brains. The company is working with the city of San Francisco to bring high-quality connectivity to lower-income residents living in the city’s public housing complexes. We look forward to sharing the details of how this local provider and the metropolitan community are finding a way to connect those who might have difficulties obtaining the Internet access we all need. Until then, you can listen to Christopher talk to Preston Rhea and Mason Carroll discuss Monkey Brains and their project in episode 264 of the podcast. Last year they sat down to have a chat with Christopher. Listen to podcast episodes here or view all episodes in our index.